Consumer pays directly to author. Social media is all about disintermediation. Therefore, it is is quite a straight forward model, but if developed it would present a real shift in consumer’s perception – paying for the content when you don’t have to ? Madness? No! It would be all about the social status and personal brand building! It could be very attractive idea for bloggers who already have well established personal brands and maintain their own platforms. 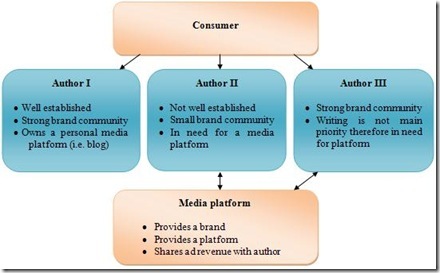 In order to implement this model the author would have to provide superior social platform where the relationship building with the community would have to be considered as main priority. According to Paul Bradshaw people never paid for ‘content’; they paid for a package and a service that included content – “They bought a newspaper (brand), not ‘the news.” In this case the newspaper would be a personal brand which would have to provide best social engagement possible. The personal branding would have to work both ways – not only author would have to get paid for well developed brand and top content, but consumer would have to receive some social points back as well. Lets say consumer could leave his name and contact details on the contributors list or virtual good system could tweet automatically that a person just made a reward or donation. Also, this model could work really great in B2B environment as the parties are much more aware about mutual benefits of marketing and social interaction . Consumer pays author – author pays media platform. Author sharing revenue with the media company – basically paying money for the platform to speak (or to be heard).It may sound ridiculous, but this model could be very attractive for less established writers who has interesting ideas but have no strong background to support them or have no capabilities/resources to build their own platforms. 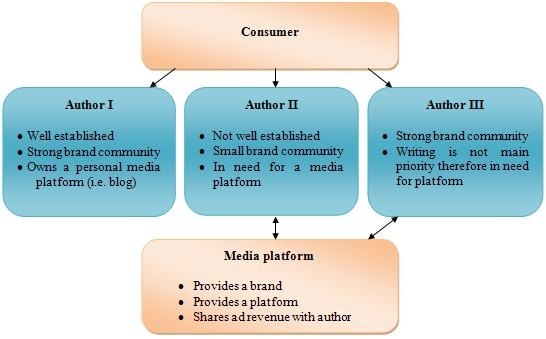 In order to implement this model the two conditions would have to be present – strong media brand and qualified but now well known writer. Young writers would be interested to have their material published on big platform for greater audience in return sharing their revenue with the media platform. Furthermore, the media platforms would be interested to maintain their brands and attract good journalist/bloggers because of advertising dollars they would bring – specialized and engaged communities created under big brand could be well targeted. If these models are implemented the outcome would be quite dificult to predict. It’s clear though, that the personal branding and community building would gain major importance in the media strategy. The content would improve and there would be less “noise” in media in the long term, because of “natural selection” process. The big media brands could concentrate on their core capabilities managing the talents rather that content production itself. Who knows maybe one day we will have our X-Factor of media? “In my dreams I have a plan If I got me a wealthy man I wouldn’t have to work at all, I’d fool around and have a ball”. – and that would be the song to sing for the audition, just the wealthy man would be the authors who bring wealth with the valuable content and community. But most importantly consumer would get to be a king, it would be able to influence, participate and gain from the process . Thanks so much, however, I am wondering if it is really effective? 2. The leading social or media brand (like Google, Facebook or Guardian) would introduce this change. What do you think? What are the main issues such system could face? Well, I do not consider myself an expert in this field. But I am in the advanced stages of completing a book on social media in business and was interested in these concepts. The idea is interesting though. Great post and thanks for sharing your thoughts. Thanks for support Mark and good luck with your book!